Inside: We updated our outdoor dining room with modern outdoor furniture -which is hard to find! I don’t know you guys I’m feeling really adult like with our new outdoor dining room all set for summer! We finally said goodbye to the cheap dining table we’d been trying to hold together for years — kept trying to tighten the bolts and slap a new coat of stain on it, but it was done. But when it came to replacing it I didn’t want to make the same mistake and buy something that wouldn’t last. 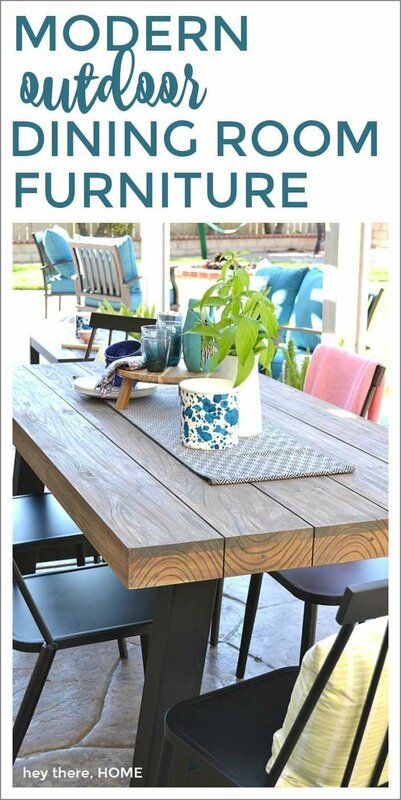 I also wanted the new outdoor dining furniture to reflect our modern style, but turns out modern outdoor furniture is a bit difficult to find. There’s lots of traditional sets to be found, but nothing caught my eye. 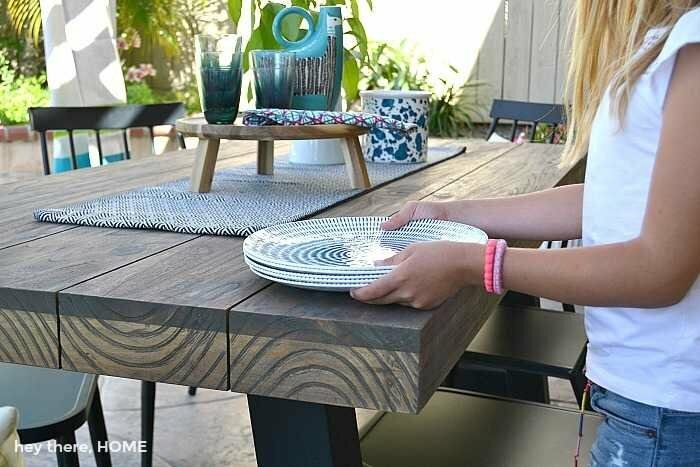 Then Article reached out to me to partner on an update to my outdoor dining room and I knew I’d finally found a source for the modern feel I wanted in my outdoor dining room! 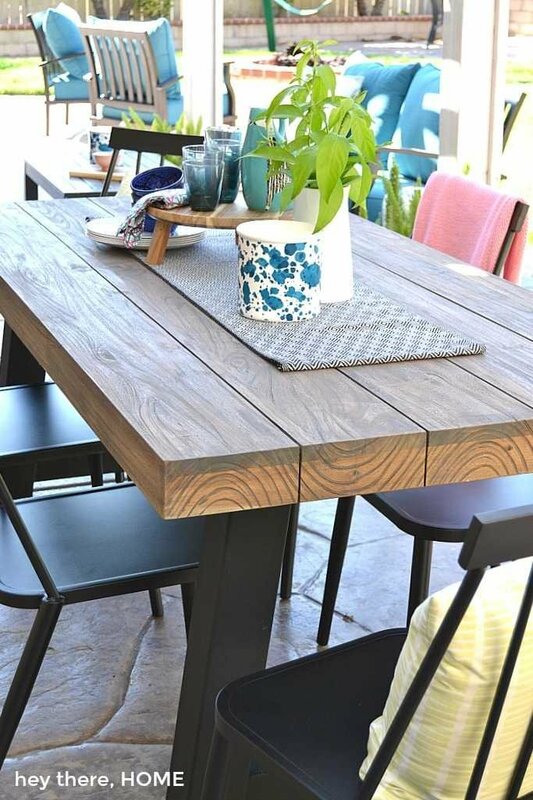 I selected the Tavola outdoor dining table because I loved the mix of the wood tones and the thick metal legs on it. 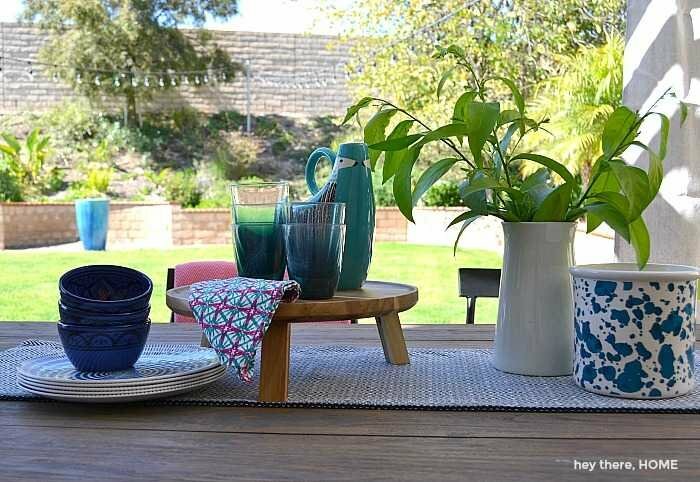 It’s really dry and hot here in Southern California in the summer and it makes it difficult to maintain wooden outdoor furniture, but one table top I can definitely handle. 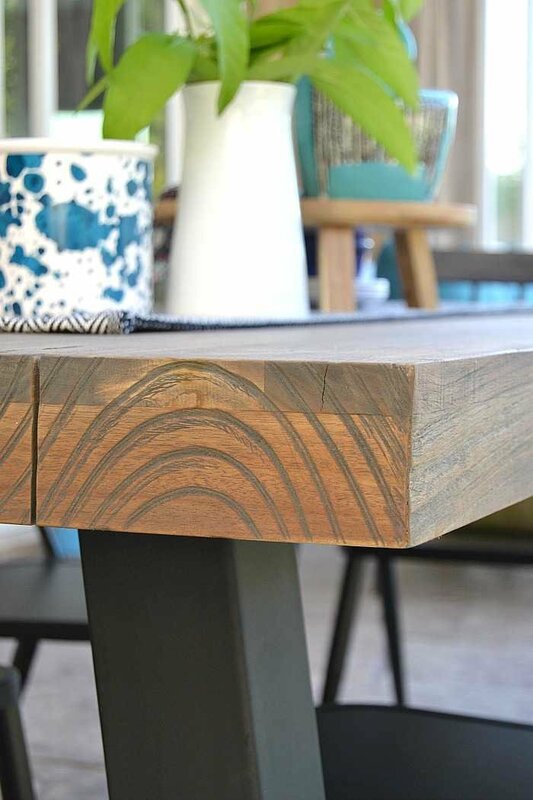 And let me tell you, this thing is solid and I love the look of the thick teak tabletop, not to mention the metal frame is powder coated so it won’t rust –hooray for low maintenance! 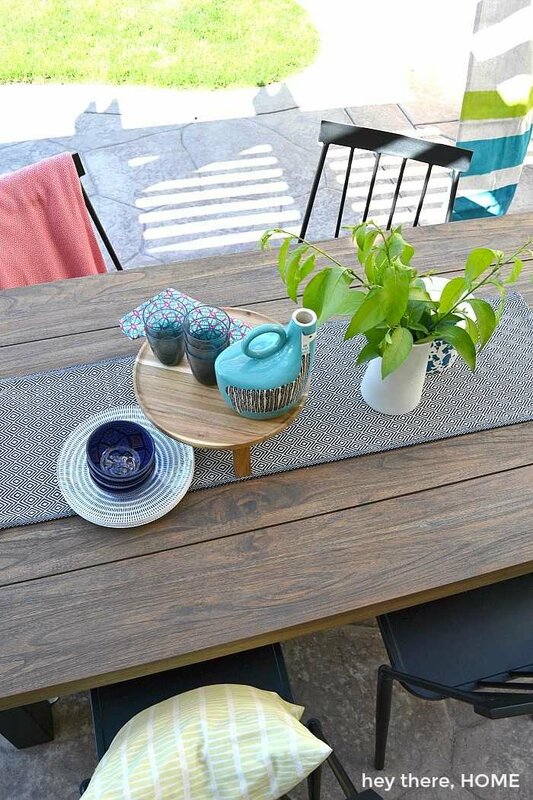 We’ve had this table for about two weeks and we’ve probably eaten dinner outside every night since. My lil’ helper even helps me set the table! Because of space, we chose the seating for six, but there is a larger version that seats eight! Then after dinner my husband and I continue to chat while we watch the kids play and it feels just like summer should. One way to make your furniture set up more modern is to not buy a set. Instead buy your pieces separately so they don’t match, but they go. 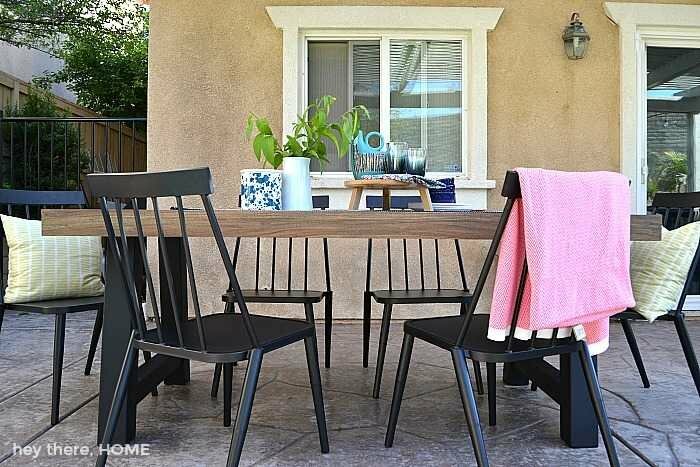 Here I decided to play off of the black metal legs and pair the table with six modern metal chairs from Target’s outdoor line and love the nod to mid-century design that I love so much. Plus they’re coated so they won’t rust and I can just wipe them down. I’m really excited about this addition to our outdoor living space. Taking the time to make it feel really good has added livable square footage to our home and I just know we will be out here most nights through the summer and probably straight through fall enjoying time with family and friends. Within a few days of placing my order I received a phone call to schedule the delivery and the best part??? They came right when they said they would, brought the very solid table out back and placed it where I wanted it AND put it together for me. 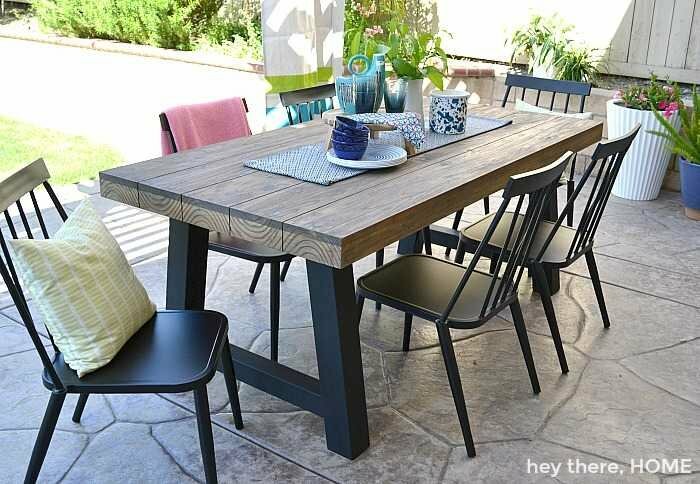 Within 30 minutes I had an outdoor dining table and we used it that night! It was awesome! 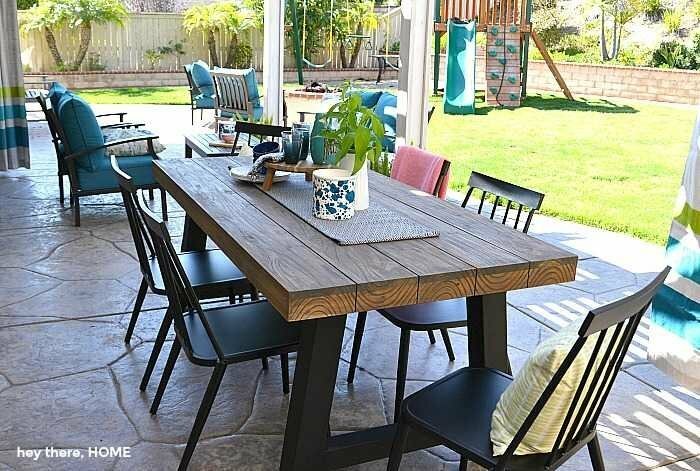 If you’re wanting to spruce up your outdoor space in a modern way, you’ll definitely want to check out Article’s outdoor selection. They don’t just stop at outdoor tables, they’ve got conversation seating, outdoor rugs, and outdoor accent furniture. Hi Rina, great questions! I just added the product sources at the bottom of the post (under the last picture) with links to most of it. I went with black chairs to play off of the black on the table legs plus I’m a big fan of the black with wood tones combo! Thanks for stopping by and letting me know Dana!